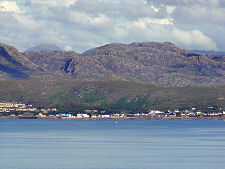 Aird of Sleat is the most southerly settlement on the Isle of Skye. 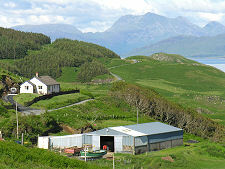 A small crofting township scattered over a hillside above the Sound of Sleat, it lies just two miles (as the crow flies) short of the lighthouse marking the tip of the peninsula at the Point of Sleat. The narrow single track road that runs for four miles from Armadale via Ardvasar comes to an end at Aird Old Church, now converted into an art gallery. From the end of the the public road a track continues for a little under two miles to a rocky, west facing inlet and a tiny harbour on the far end of the peninsula. A path that wends its way between the remote crofts here continues south for a further ¾ of a mile to the lighthouse itself. 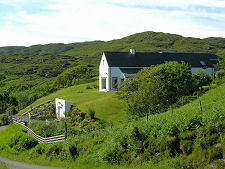 The Point of Sleat Lighthouse was first established in 1938 and the current light dates back to 2003. 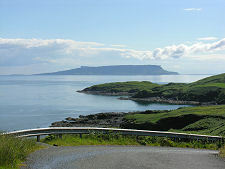 From the lighthouse, despite its lack of altitude, the views are enormous, extending to the Cuillins to the north west, and around and past the mountainous island of Rum to the west and the distinctive profile of its neighbour Eigg to the south west. 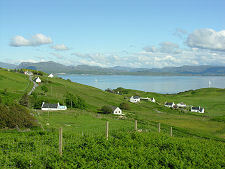 To the south is the distant Ardnamurchan Peninsula, while from the south east to the east the view comprises the west coast of Morar, getting steadily closer as it progresses from Arisaig up to Mallaig. 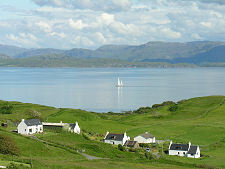 But you don't need to take the walk out to the lighthouse to enjoy superb views. 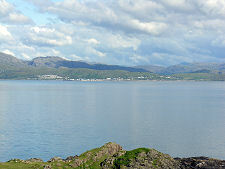 The geography of this end of Sleat, which rises to almost 900ft at the highest point in the inaccessible centre of the peninsula, blocks views of Rum and northern Skye from further along the coast facing the Sound of Sleat. 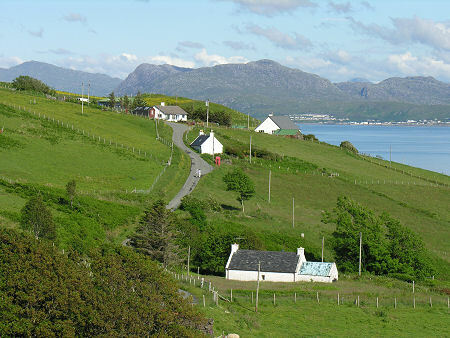 But a number of parking places on the single track road from Ardvasar to Aird of Sleat offer views that in some ways are even better than those from the lighthouse. This is because the viewpoints are higher, at between 150ft and 200ft above sea level, and because what you are looking at is closer. 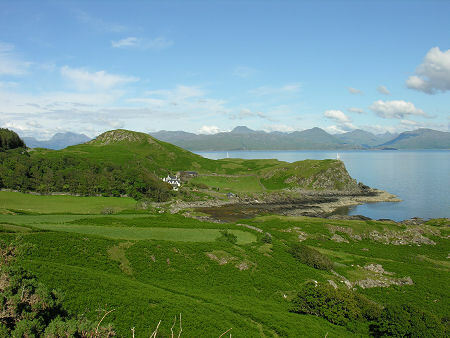 As a result the views across to the Silver Sands of Morar and to Mallaig are unsurpassed, while if you look a little to the further north, the magnificent mountainscape of Knoydart, invisible from the lighthouse, becomes the central feature. 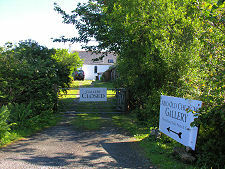 As already noted, there is a gallery at the end of the road in Aird of Sleat, but otherwise there is little in the way of organised visitor attractions at this end of the peninsula. This is a place to come on a beautiful day with excellent visibility, and when you want to be reminded of how beautiful western Scotland really is.